• It's tons of fun for kids! © 2016 goopee-the-clown.com All rights reserved. 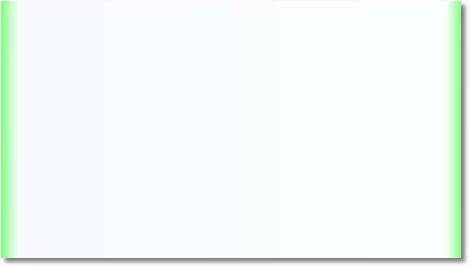 Looking for birthday party ideas ? 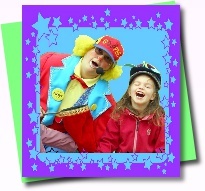 This professional and magical display of comedic chaos is based on audience participation and highlights the birthday child (or a close friend) as a fully costumed MAGICIAN, ideal for memorable birthday party photos. 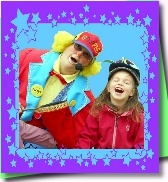 It is a rib tickling magic performance complete with the magical appearance of Stu the baffling bunny who loves to be patted. 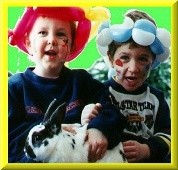 And finally, the birthday girl or boy will help create BALLOON ANIMALS and cheerfully present them to your eager guests as yet another happy keepsake of your child's special birthday party. 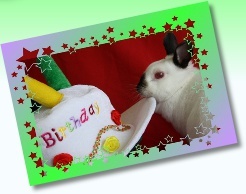 Your birthday party will be a hit with magic, bunny and balloons! 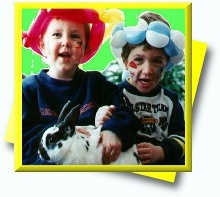 You'll create fun filled memories with face painting, magic, fluffy rabbit and balloons! 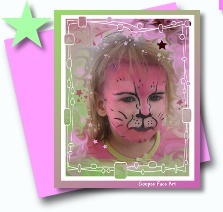 Try Goopee's artistic face painting for your birthday party. 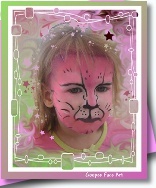 A great party idea for picture perfect face painting mementos. One of the most popular birthday party ideas.